Jorge Lorenzo posted this photo to his Twitter page earlier today. Love to see him back in top form. His ability to ride at 99.9% for lap after lap after lap is simply unbelievable. No, not every race, but frequently. Should be a great year. What is wrong with you people? The article said the surgery was successful and he’s expected to be available to ride at Qatar. That’s great news! It’s unbelievable how dark some peoples’ hearts are, to even consider I was happy about his injury. Jabe and HS1, thank you. You guys can ride with me anytime. I broke a scaphoid on left hand – Had surgery in August and cast was not off until December. It is a prime bone in hand. I would not be surprised if we didn’t see him until June. I sympathize and your experience would be the same for many of us. These guys are distinctly different. Dr. Mir gave a nice interview on MotoGP.com and he indicated “for sure at Qatar”. … I dont know, but i’d bet thats from a high side, then slapping his hand as he tumbled. I think it’s too early to know either way. It’s a bone that doesn’t heal well and can become a chronic source of pain. It can also be removed. Press releases from Honda are highly unlikely to tip if there is a problem. I do wish for any MotoGP competitor good health to compete at their best without pain. If you mean that it is great news that the surgery was successful, and the Jorge is expected to be fully fit for the Qatar test and the start of the season, I agree. If you mean that you are happy that he was injured, you need to go home and rethink your life. Come back to MotoGP when you are a decent human being. 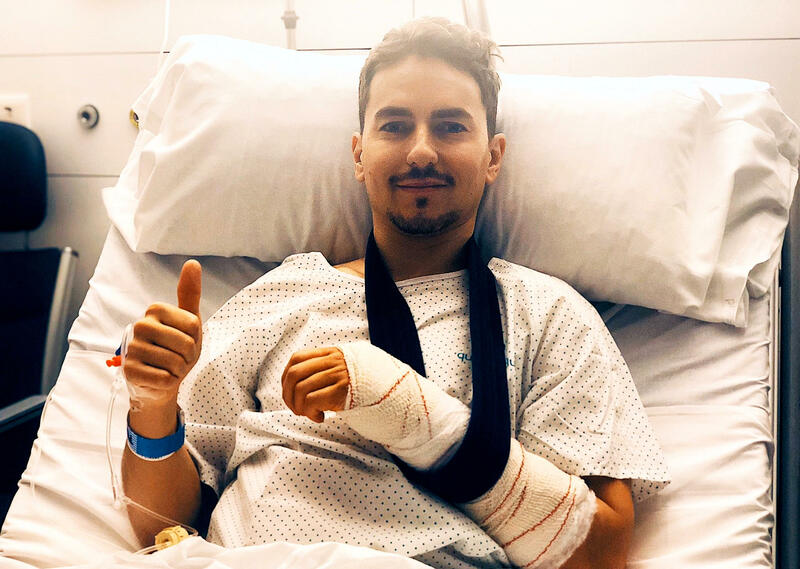 The article commented on bmbktmracer is about Jorge having successful surgery. Inferring that his comment was about something else, unless he has established a history that I’ve missed, seems pretty nasty. A completely different article announces the injury. Maybe we all just need a hug.